“You should see bab’uSithole’s hands; they are like this,” Mam’Sipho says and pauses from plaiting her customer who is sitting on a red plastic chair in the middle of Kerk street, to emphaise the point by curling her fingers. Bab’uSithole is the Zulu man who started the street hairdressing business on corner Eloff Street and Kerk Street back in 1993. This is where Mam’Sipho does hair. Bab’uSithole does not do hair anymore, Mam’Sipho says. He is on pension. “The way I see it, he has arthritis but he mistook it for a stroke. That’s what he said. I spoke to him and I said ‘no this is not stroke; stroke is not like this. If it was a stroke, you wouldn’t be able to control your fingers’. But you know South Africans, they earn grant for disability and all that,” she says with a mock twang and laughs. Mam’Sipho laughs a lot and flashes a dazzling smile every time she speaks. She is big and bubbly with inquisitive, piercing eyes. She is originally from Zimbabwe but came to South Africa in 1990 or ’91 – she is not too sure. She started working on Kerk Street in 1993 and has been here ever since. “I have six kids. I did it six times,” she says and laughs, again. Mam’Sipho is 47 years’ old. Age has barely touched her face. She has given birth to six children, two (a boy and a girl) of which are still in primary school. The two visit her every day on their home from school. “The other one is standing there,” she says, picking out her daughter, 9, who is squeezing her way through a mash of people crowding Kerk and Von Brandis Street. She has on a blue tunic and a navy jersey. Her brother, 11, drags his feet slovenly behind her. The boy’s name is Ramsey but the Kerk street hawkers call him Popo. The girl is Fezile. Through the milling crowd of traders and buyers and the cluster of goods a man calls out to Mam’Sipho upon spotting her “two little ones” as she calls them. “Mamazala!” the man shouts, lumbering towards her chair where she is still tending to her customer. “Yebo mkhwenyana!” she calls back. “Do you see how big your boy Popo is?” the man says in a hoarse voice. “He needs to exercise. He is even bigger than me?” “Ah Mkhenyana, bigger than you?” “He has a big mkhaba. What size does he wear? I’m sure his trousers are tailored now?” the man says, catching his breath. “Who? Bobo?” Mam’Sipho laughs. “Vele, it is so, I ordered these ones from Indians. You see yourself that he is shaped like an Indian.” Mam’Sipho has a candour about her that seems to attract vendors and customers to her like moths to a lightbulb. This effect has been good for her business. On average she make about R800.00 a day, although she is quick to say that when days are good she takes home a lot more. With her hairdressing business she has been able to buy a house in Zimbabwe and pay the R5300 monthly rent for her two-bedroom flat on Plein and Joubert street. 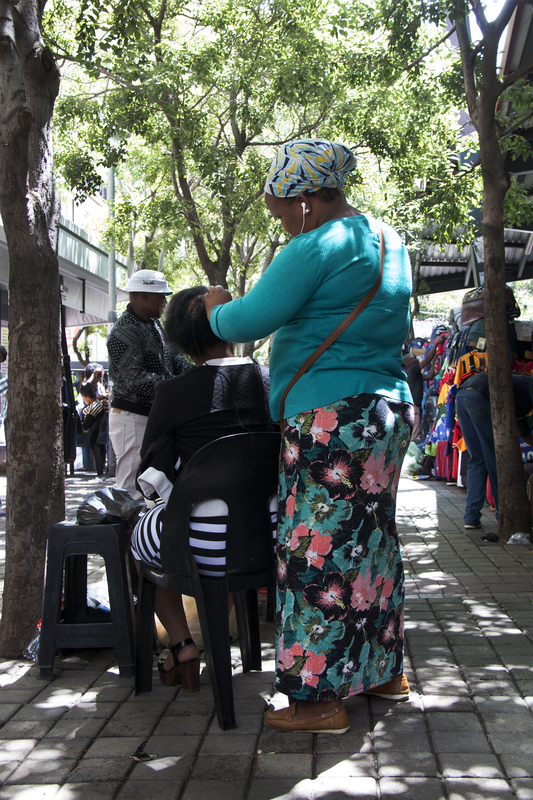 THE BEST HAIRDRESSER IN TOWN: Mam’uSipho (blue top) is the block leader of Kerk Street and her chair is always busy with the young women who come from near and far to get their hair styled by her. However, things have not always run so swiftly on Kerk Street. Bab’uShezi can attest to that. He is part of the original trio – Bab’uSithole, Mam’Sipho, and then him – who started the hairdressing business on the narrow street. Like Bab’uSithole, he also hails from KwaZulu-Natal. His bone of contention has to do with the formal vending stalls that were built in 2010 – for the Fifa World Cup – which were intended to formalise their business. 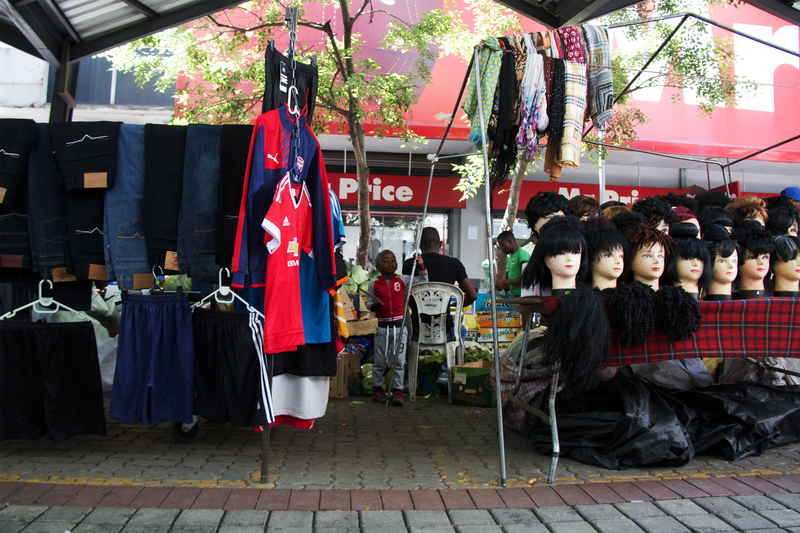 The City of Johannesburg announced that hairdressers were forbidden from the new flea market, Bab’uShezi says. They even made us cards and then they came back and confiscated them. That’s when they introduced these new people, he says with visible contempt at the hawkers shielded in the shade. “We don’t know how these people got their stalls – whether they bought them or not,” he continues, shaking his head and working the hooked needle in his hands around the balding spot of his customer, who’s asked for a weave. On this last score a twitch of angry satisfaction flickers across his face. Bab’Shezi is a very proud man. He is short and wears a greying goatee, his signature spottie (bucket hat) hangs down one side of his head as he speaks. His hands work mechanically, drawing the threaded needle in and out of his customer’s loose coif of damaged hair. Bab’uShezi doesn’t know how old he is but he says he was born in 1964. “When was it when they wanted to forcibly remove us from here?” he turns round and asks another hairdresser close by. “It was that time when they were cleaning up the city,” the woman says with a sigh. “Yes, that time,” he retorts. 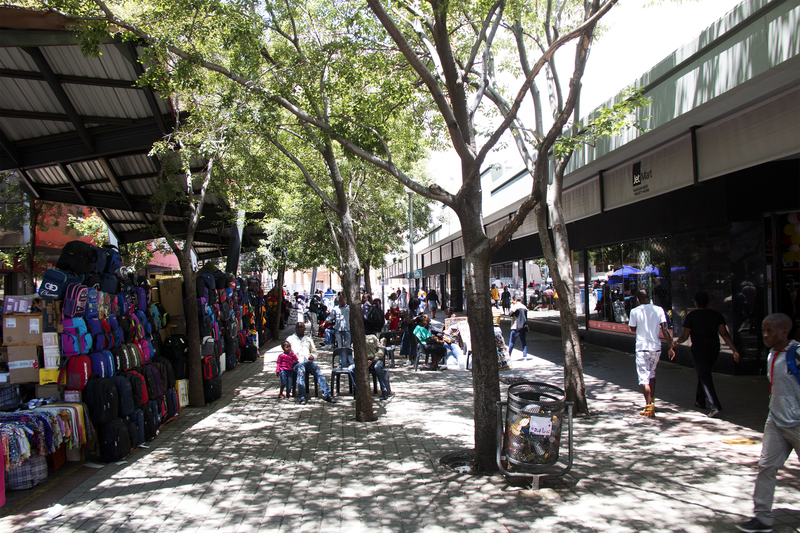 CLICK TO VIEW GALLERY: Kerk Street is a crowded strip in the inner city which has been demarcated for hawkers. 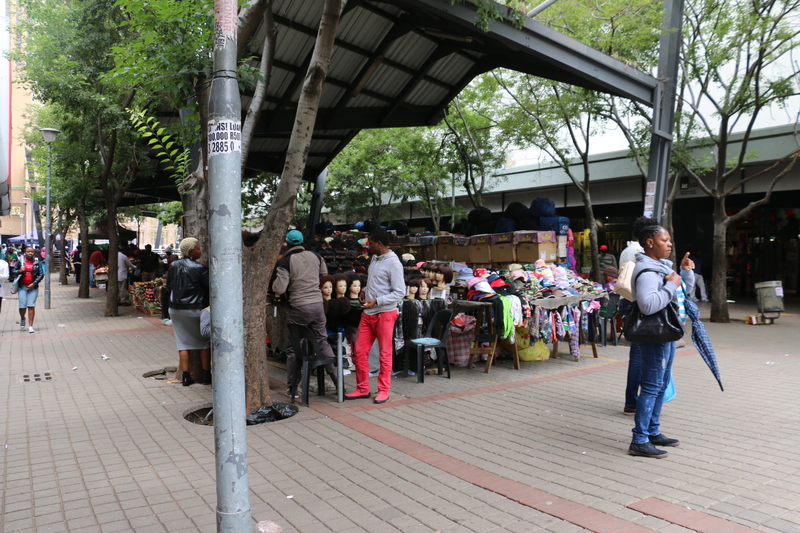 While the hawkers have been granted permits to operate in this area, the hairdressers are still being chased away from time to time by JMPD. 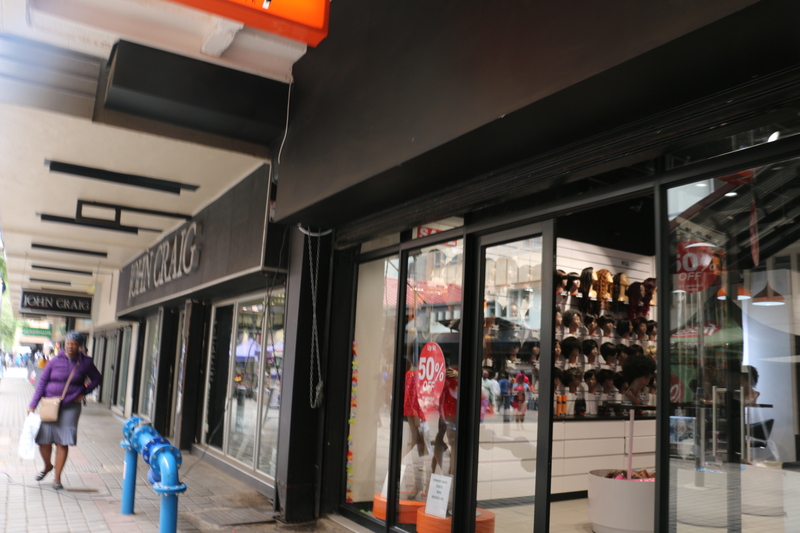 They have contempt for us hairdressers, Bab’uShezi says, dialling up his own contempt at the way the city and its Metro police treat him and his colleagues. “They say we aren’t needed here. Now that we’re inching closer to december…” “They also came here three months ago,” the woman cuts him. 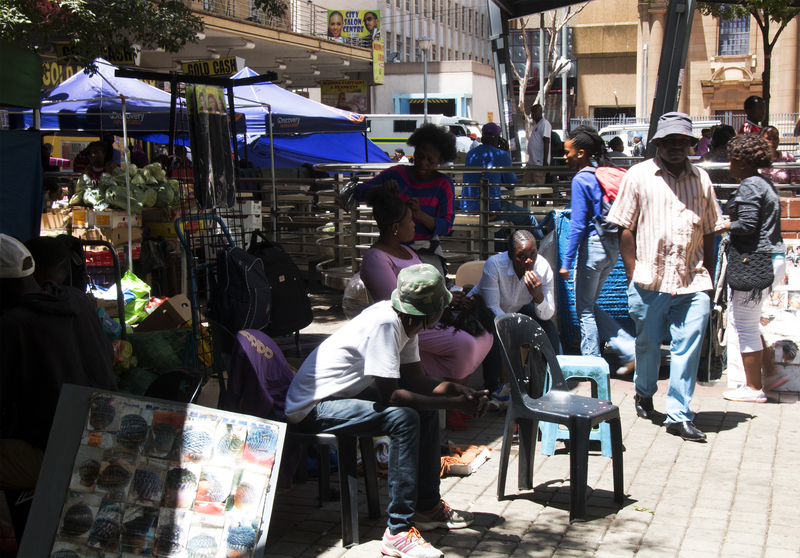 Bab’uShezi says he has collected the names of the elderly hairdressers who work on Kerk Street and took them to a lawyer “who was helping us; his name was Mantanga, and he took our case to the high court. 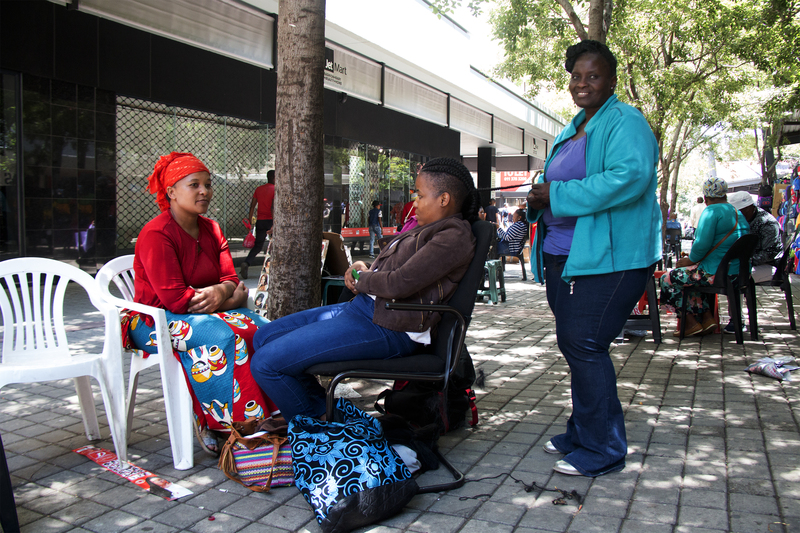 When it rains there is nowhere for Bab’uShezi, Mam’Sipho and their swish of hairdressers to find shelter. They hide beneath the covering of JetMart and sometimes, while they’re there, Metro police come and confiscate their equipment. And that equipment is never returned. Kerk Street is a cacophony of cars and taxis and cops comingling with the rush of bodies passing through this section of downtown Johannesburg. Against the steel fence of the South Gauteng High Court on Von Brandis Street. 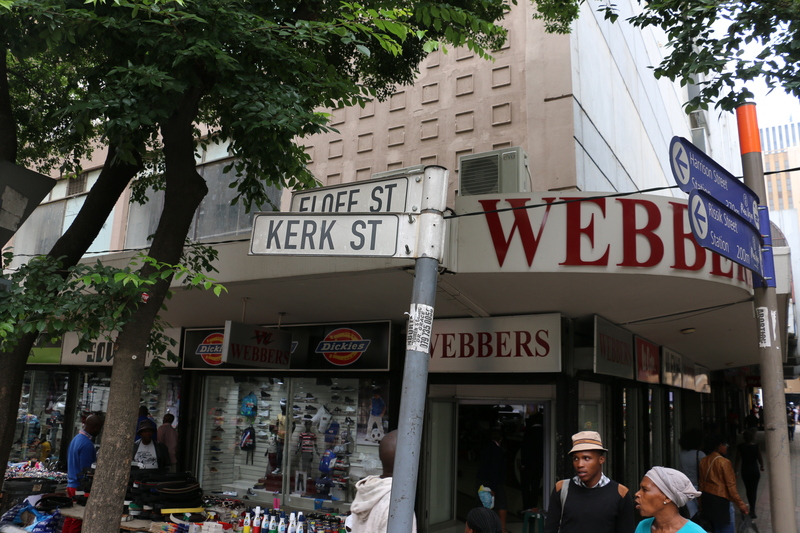 just off Kerk, loiters a group of young men – tsotsi’s – who are attracted by the booming hair business here. Vimba means ‘catch him’. It is an infamous yell, a siren that has become synonymous with hawkers downtown. 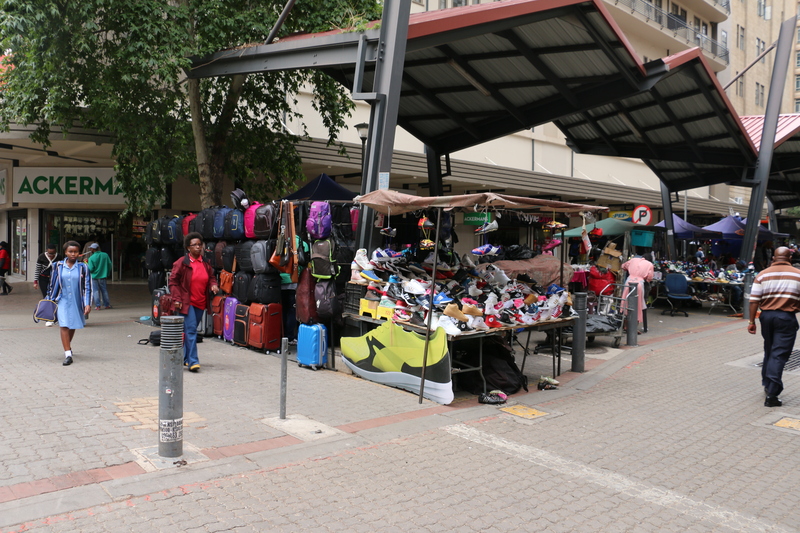 You often hear it when a tsotsi is on the run after snatching an item on sale at one the hawkers’ stalls. The yell alerts hawkers and bystanders alike and has led to many a vigilante mob that delivers raw justice on the pavements of inner city Johannesburg. “When you ask the Metro police what they are doing they tell you that you are not wanted here,” Bab’uShezi says, angrily. “And the irony is that we were here first. The oldest practitioners here are Sipho and I. All these other people” – he gestures to the sellers in the stalls – “they found us here. Now we live this wretched life where we are harassed constantly by Metro police. Hairdressers on Kerk Street have mulptiplied since Bab’uSithole, Mam’Sipho and Bab’uShezi began all those years ago – and so have styles. Styles depend on what’s in, Mam’Sipho says while weaving an intricate design on one of her old customers’ crown. “Most people ask for the style that’s the in-style,” she says, eyes fixed on the young woman’s head. “There was a time when there was the razor cut; there was a time when this style came in (she gestures with her eyes to the young woman whose hair she is plaiting), it is called Pontofina. So it depends on what’s in fashion – it’s like clothes. It’s like a label. 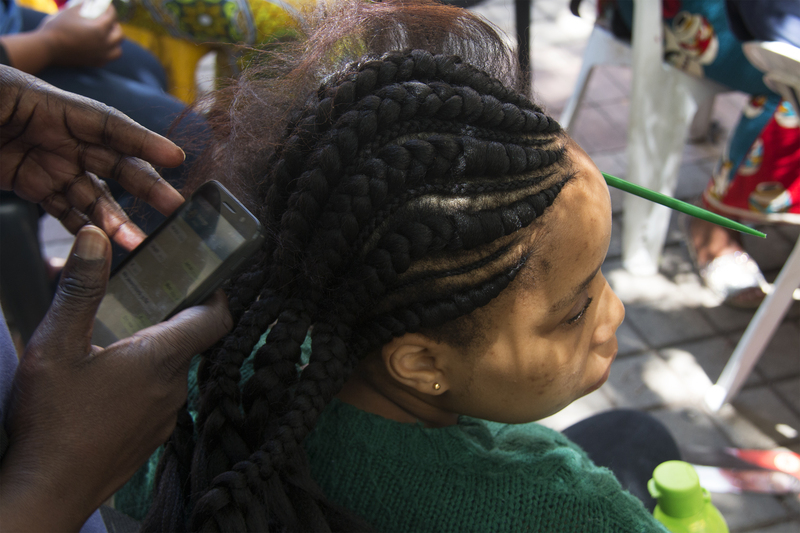 The young woman being plaited by Mam’Sipho’s studious hands is Simphiwe Maseko. She is a student at the University of Johannesburg. She’s been coming to sit in Mam’Sipho’s chair since 2014, since she started going to varsity. “I was passing here, actually, and I saw her doing hair and I was like, no, this is nice, then I asked her if I could come do my hair with her and then she was like, you can come, it’s fine, then I came. She did my hair and I was happy. That’s when I started coming more often. My first hairstyle was a straight back. It was these same braids but straight back,” she says pointing to the style Mam’Sipho is currently weaving on her head. Maseko hasn’t had her hair done elsewhere ever since that first day in Mam’Sipho’s chair. The dangerous elements, which are so ubiquitous as to be the very air one breathes in downtown, have not succeeded in deterring both clients and hairdressers. Zandile Zwane, an inner city resident, moved into Kerk Street in 2006. Before then, she was a student at one of the computer colleges in town. “I found out that computers are not my thing, but i had a talent for doing hair but I wasn’t that perfect,” she says. 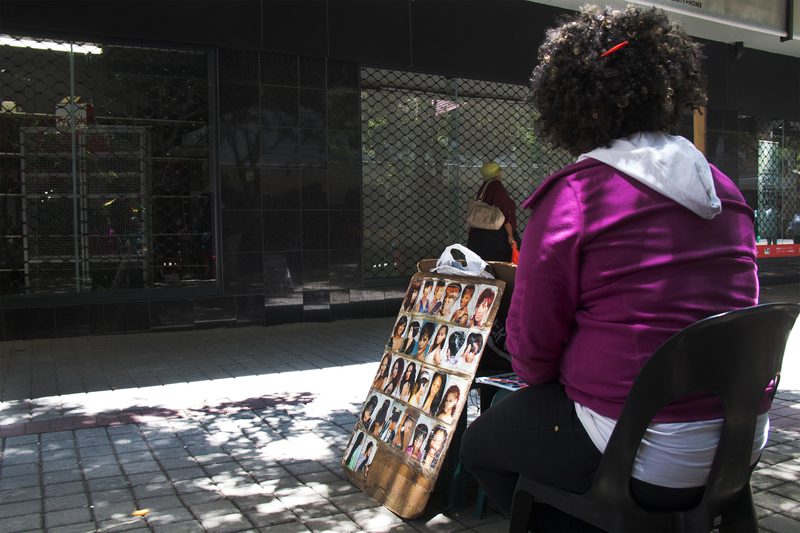 When she used to pass Kerk Street on her way to her computer course she would stop and ask the elderly men who crochet hair with a needle to teach her how to do it. After her brief training she went back home and practised. She already had a certificate in hairdressing but she didn’t know how to plait and crochet hair. 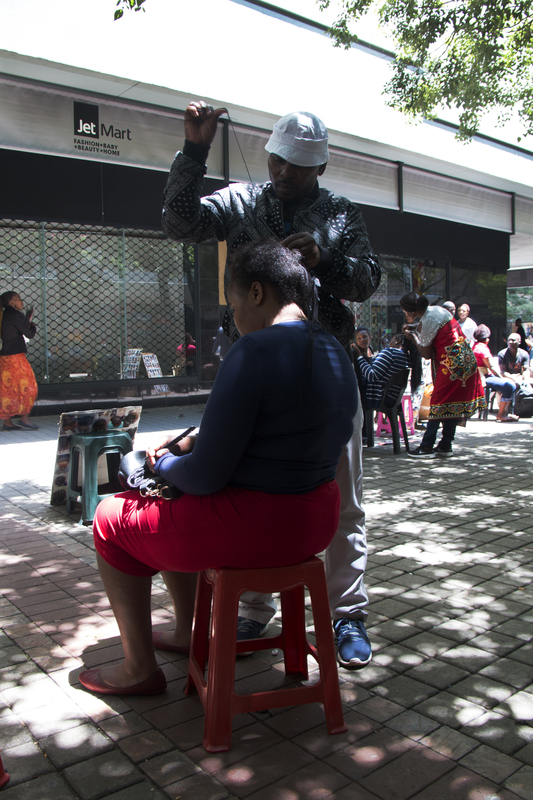 After she was confident she could plait and crochet hair she took up a spot next to Mam’Sipho and has been on Kerk Street ever since. The clouds above the city turn a dark grey colour and are pregnant with rain. Few moments pass before the first spittle begins to wet the street. The hairdressers usher their clients to the JetMart canopy. Soon the rain starts pouring vehemently as the population of Kerk Street runs for cover. Mam’Sipho maintains a jubilant smile even as the rain washes down, turning small rivulets slowly into rivers of waste along the gutters of Eloff and Von Brandis Street. Bab’uShezi looks up at the sky as if quietly cursing God for all the inconvenience. He casts his eyes back to shock of hair before him, and with his hooked needle begins to weave away.